11:18 am: Are we there yet? Most of the kitchen is in its final form now, and we're just waiting to hear from the contractor about when his people can come hook up the lights and appliances. 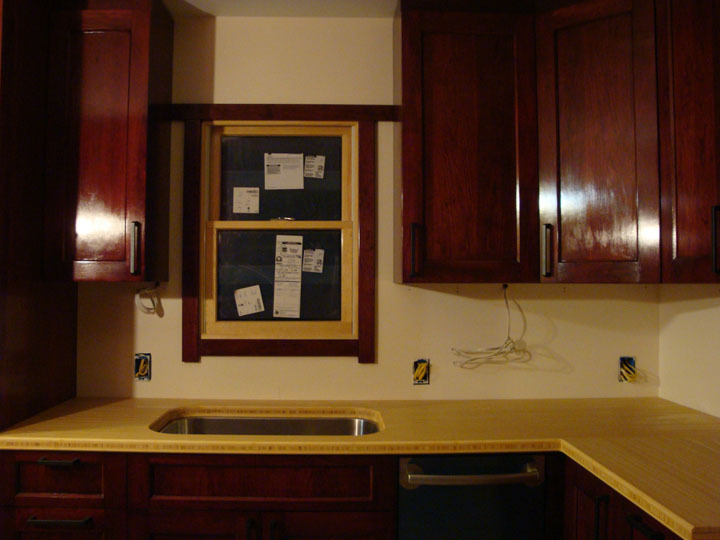 The bamboo countertop is in, and it looks great. While we're sitting around waiting for the next step, my dad decided to fill in some dead space under the doorway beam by building me some custom shelves to hold all my cookbooks. Once the appliances are installed, the final step will be putting up the tile backsplash. Hopefully we'll be cooking in the kitchen within the next few days. Moving all the pots and pans and dishes and silverware and food items out of storage to fill all the cabinets is going to be a huge task. Thanks! I definitely owe him a lot. That is fantastic! 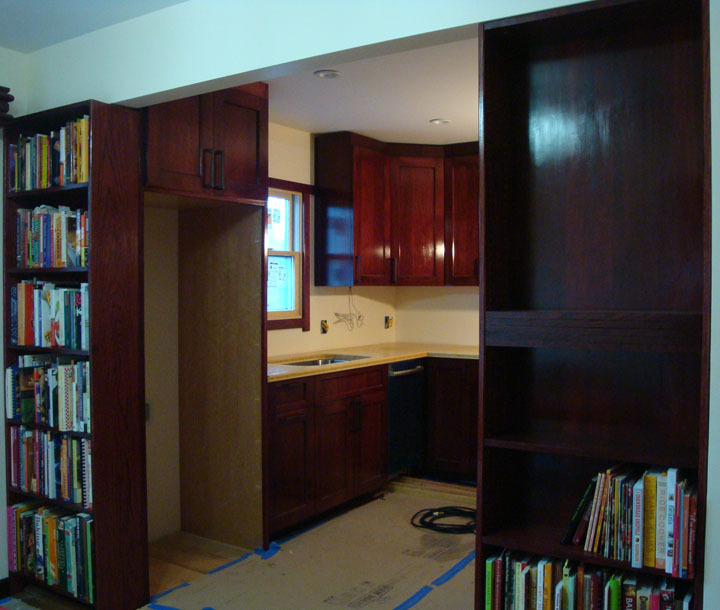 I can't believe the shelves match the cabinetry so well (or rather I can, because your dad is a genius like that). I agree! And it's genius to put bookshelves there! Thanks! Everything about it cost ridiculous amounts of money, but I expect I'll be getting a lot of use out of it for years to come. shouldn't this overhang the sink so you don't get leakages/damp between sink and contertop? No, it is designed so that the stainless steel rim of the sink is visible, for aesthetic reasons, and also to make it easy to clean. The place where the bamboo and stainless steel meet is filled with waterproof caulk to prevent any leakage.